Established in 1998, VNA of Ohio’s Chronic Disease Management program helps physicians care for patients at home with congestive health failure (CHF), chronic obstructive pulmonary disease (COPD), hypertension, coronary artery disease, chronic pain and obesity. “Over the past 16 years, as chronic disease management has become more sophisticated, so has our approach – through the use of technology and face-to-face patient and family education,” says Claire M. Zangerle, RN, MSN, MBA, President/CEO of VNA of Ohio. “Our goal is to keep our patients home – out of the ER and out of the hospital – by helping them and their physicians manage their chronic disease. VNA of Ohio was reportedly one of the first in Ohio to offer an in-home electronic health monitoring program for chronic disease management. Appropriately named TeleHealth, the program – which is free of charge to qualified patients of VNA of Ohio – utilized Honeywell’s HomMed Health Monitoring System to collect, transmit and track a patient’s vital signs on a daily basis according to parameters set for the patient by his/her physician. This enables detection of even slight health changes and allows intervention before a problem escalates. 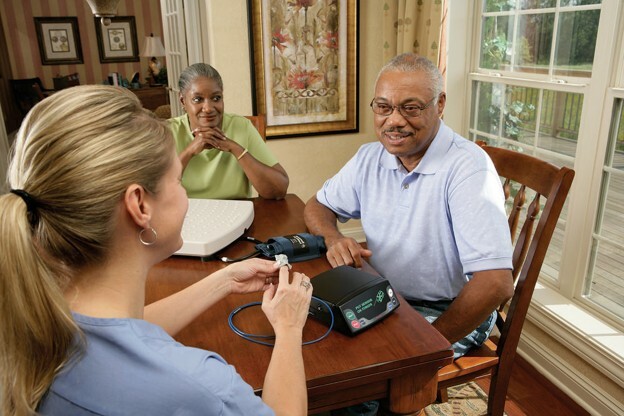 The patient’s in-home equipment includes a monitoring unit (approximately the size of a clock radio) and a variety of medical device peripherals or attachments, such as a scale to measure body weight or a blood pressure cuff. The monitor can be connected either to a phone landline or to a mobile device. The monitor is also programmed with the time the patient prefers to be tested each day. At the designated time, the monitor will automatically turn on, any a friendly voice will, “Good morning. It is now time to take your vital signs.” Voice prompts, such as, “Place the blood pressure cuff on your right arm, above the elbow. Tighten securely,” guide the patient through the collection of their vital sign data. Simple yes/no questions such as “Are you having any dizziness?” are also asked. If the patient does not respond within a certain amount of time, the monitor will continue its voice prompts at half-hour intervals for up to two hours. If data isn’t received at VNA of Ohio’s central station, a nurse will call the patient to find out why. “The VNA of Ohio nurse or aide that’s going in and out of the home on a regular basis is emphasizing, ‘remember to do this every morning,’ so our patients compliance is very good . . . 90% ,” says Zangerle. Once received by the central station at VNA of Ohio, the information is reviewed and tracked by specially trained nurses who take appropriate action, such as calling the patient’s doctor or instructing the patient to take the pre-prescribed medications, as needed. Routine reports are also sent to patients’ physicians to enable early detection of subtle changes in health status. A major benefit of telemonitoring is that it motivates patients to take an active interest and become more involved in their own care, perhaps because they know someone is watching. VNA of Ohio statistics for its TeleHealth patients show similar outcomes: 19.85% reduction in emergency care events, 29.78% reduction in inpatient events, and 4.25% reduction in 30-day readmits with same diagnosis. “Not only does our TeleHealth program reduce ER visits and hospital admissions, it also improves functional status for our patient,” says Zangerle. So why don’t all hospitals and healthcare organizations offer telemonitoring programs? According to Zangerle, because there is no insurance reimbursement for it at this point in time. She hopes that will change in the near future. In the meantime, VNA of Ohio TeleHealth is available to patients whose physicians order VNA of Ohio home healthcare, and it is free to qualified patients. There is no equipment purchase or rent, no set up or maintenance charges and no monthly fee. “If a patient has a chronic disease, and their physician wants to keep that patient home – and out of the ER or hospital – feeling functionally well and doing well and managing their own chronic disease, the physician needs to order home healthcare,” says Zangerle. For more information or to refer a patient, physicians may call 1-877-698-6264. Information is also available at VNAohio.org. Learn more about VNA of Ohio chronic disease management services, or call us today at 1-877-698-6264.